Lock in a great price for The Laguna, A Luxury Collection Resort & Spa, Nusa Dua, Bali - rated 9.1 by recent guests. The Laguna is a very nice place to stay in Nusa Dua. The resort has a laid back vibe and calls: relax! The ambiance is very pleasant and the lagoon system very pretty. Awesome breakfast! Everything was pristine and fantastic. Beautiful gardens and pools, central location and the best service. The pools, the beach, the opportunities to relax all day without being bored! We had a great holiday! Swimming pools are accessible from any point and they are fantastic, overall the place is really relaxing and pleasant thanks to a stunning nature. Staff is very gentle and supportive. I also appreciated the breakfast with many kind of sweets which is the only thing I like for breakfast. The staff is very courteous . Location is right next to Bali collection which made it so convenient . The private butler service was exceptionally good and they were really friendly and nice . The breakfast was a good spread and tasty . Lagoon facing rooms and a beautiful property , we loved it . It is very very nicely set Hotel complex.. Big selection of swimming pools, all nice and very clean. Breakfasts are very rich with a plenty selections. Personal were extremly friendly and polite. Everything was just perfect and the staff were wonderful and you couldn’t fault them. One of our top picks in Nusa Dua.Bordered by a white sandy beach, The Laguna features 7 large lagoon swimming pools and stunning views of the Indian Ocean. 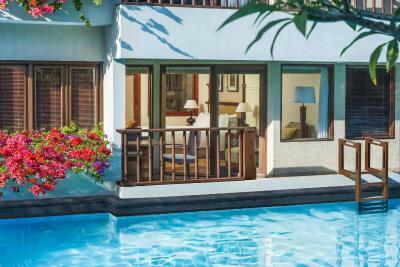 Set amid landscaped tropical gardens, it offers spacious accommodation with around-the-clock, on-call butler service. Rooms and villas at The Laguna are decorated with wooden furnishings and flooring. Featuring a balcony, these air-conditioned accommodations are equipped with an flat-screen TV with DVD player. The friendly concierge staff are able to arrange for a variety of recreational activities, including kite flying, sand sculpture and water sports. The Lagoon spa offers a range of beauty treatments. Providing free Wi-Fi throughout the building and free on-site parking, the hotel features a fitness centre and tennis courts. Offering direct access, the two small islands, Nusa Bagu and Nusa Peninsula can be accessed from the beach. Just a 5-minute drive to the Bali Collection Shopping Gallery, it is a 20-minute drive to popular Uluwatu Temple. Bali International Airport is a 20-minute drive away. All-day dining is available from Banyubiru, which offers a menu of Western and pan-Asian dishes. 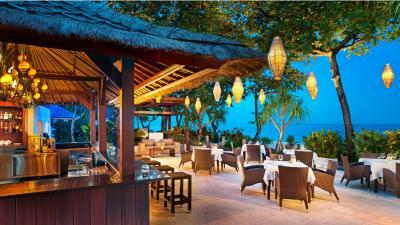 The beachfront restaurant Arwana serves fresh seafood. Signature cocktails and light refreshments can be enjoyed at the poolside Kul Kul Bar, Cascade Bar, and Sapphire Lagoon Bar. This property also has one of the best-rated locations in Nusa Dua! Guests are happier about it compared to other properties in the area. 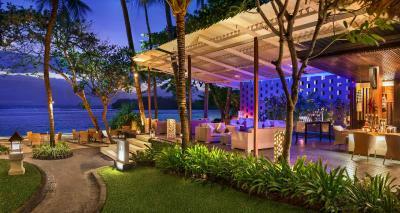 The Laguna, A Luxury Collection Resort & Spa, Nusa Dua, Bali has been welcoming Booking.com guests since 28 Mar 2012. 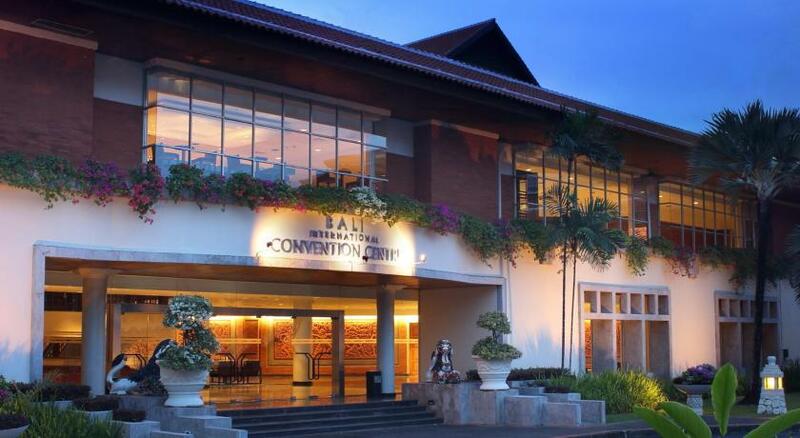 When would you like to stay at The Laguna, A Luxury Collection Resort & Spa, Nusa Dua, Bali? These air-conditioned deluxe rooms overlook the tropical gardens from a private balcony. The spacious rooms include a sofa, a flat-screen satellite TV, a minibar, a personal safe, a working desk, and an en-suite bathroom with fresh towels, cotton bathrobes and slippers, and other luxurious toiletries. These air-conditioned deluxe rooms overlook the blue turquoise lagoons from a private balcony. These spacious rooms include a sofa, a flat-screen satellite TV, a minibar, a personal safe, a working desk, and an en-suite bathroom with fresh towels, cotton bathrobes and slippers, and other luxurious toiletries. These air-conditioned studio rooms overlook the tropical gardens or turquoise lagoons from a private balcony. The spacious rooms include a sofa, a flat-screen satellite TV, a minibar, a personal safe, a working desk, a living room and an en-suite bathroom with fresh towels, cotton bathrobes and slippers, and other luxurious toiletries. These air-conditioned deluxe rooms have direct access to the blue turquoise swimming lagoons from a private balcony. The spacious rooms include a sofa, a flat-screen satellite TV, a minibar, a personal safe, a working desk, and an en-suite bathroom with fresh towels, cotton bathrobes and slippers, and other luxurious toiletries. These air-conditioned suites overlook the tropical gardens or turquoise lagoons from a private balcony. The spacious suites include a sofa, a flat-screen satellite TV, a minibar, a personal safe, a working desk, a separate bedroom & living room, a private dining area, and an en-suite bathroom with fresh towels, cotton bathrobes and slippers, and other luxurious toiletries. Boasting a private outdoor pool and a private terrace with gazebo, this air-conditioned one-bedroom villa is located in the resort’s tranquil tropical gardens. The villa comprises of a separate bedroom and living room as well as a private dining area. This villa is equipped with plush sofas, a flat-screen satellite TV, a minibar, a personal safe, an outdoor shower, and an outdoor massage table. There is a kitchenette with full-sized fridge and various cooking utensils. The en-suite bathroom has a separate bath and shower facilities as well as a walk-in closet. Fresh towels, cotton bathrobes and slippers, and other luxurious toiletries are also provided. These air-conditioned studio rooms have direct access to the blue turquoise swimming lagoons from a private balcony. The spacious rooms include a sofa, a flat-screen satellite TV, a minibar, a personal safe, a working desk, a living room and an en-suite bathroom with fresh towels, cotton bathrobes and slippers, and other luxurious toiletries. The resort offers distinctive dining venues, bars, the luxurious Lagoon Spa, 24-hour Fitness Center, complimentary Wi-Fi, sophisticated meeting venues that are enhanced with the uncompromising Butler Service and the signature Concierge Service. House rules The Laguna, A Luxury Collection Resort & Spa, Nusa Dua, Bali takes special requests - add in the next step! The Laguna, A Luxury Collection Resort &amp; Spa, Nusa Dua, Bali accepts these cards and reserves the right to temporarily hold an amount prior to arrival. The Laguna, A Luxury Collection Resort & Spa, Nusa Dua, Bali accepts these cards and reserves the right to temporarily hold an amount prior to arrival. Please note that the credit card used for the reservation must be valid throughout the entire stay and must be presented during check-in. If booking is made on behalf of someone else, guest must contact the hotel directly to arrange for third-party billing. In celebration of Nyepi Day (Day of Silence), no check-in or check-out is allowed on 7 March 2019. Ngurah Rai International Airport will be closed, motor vehicles are allowed on the streets only for emergencies and guests are confined to the grounds of the resort. The beach is OK, but don’t expect white sand as shown in the promo pictures, that’s photoshop as the colour of the sand is yellow... Which I think is really unfair and unprofessional from such a hotel brand. Also, the low tide may come rather early during the day and you can’t swim at low tide as the bay becomes very shallow. When we stayed (beginning of April), at 2 pm you no longer could swim. The rooms are a little dated and would deserve refurbishment. The menu for the pool/bars was rather limited in range. Overall, the food offered in the restaurants, including breakfast, could improve further. For example, the nearby Westin offers a better culinary experience. This does not mean that the service currently offered by The Laguna is poor, it could just go further up a notch! It is a little old. For 5 star hotel you expect more. Fantastic service with extremely friendly staff. Every request was handled immediately. Beds were very comfortable and the rooms immaculate! This is an amazing property in every way. The pools and lush landscape make for a beautiful setting in which to relax. The hotel staff are so welcoming and eager to assist. The beach is beautiful and there are plenty of comfortable loungers to choose from. The Laguna Resort is definitely a 5 star hotel. Check in time was long.